PRESIDENT Mnangagwa today heads to Parirenyatwa Group of Hospitals in Harare for the national monthly clean-up exercise as Government intensifies efforts to build sustainable environment management and waste disposal systems. This comes as the Ministry of Primary and Secondary Education yesterday threw its weight behind the exercise, urging all schools to clean their environments to ensure they are conducive for teaching and learning purposes. Government has set the first Friday of every month as the national environment cleaning day. In Bulawayo officials said the focus is still on Makokoba, 6th Avenue Extension and the marketplace which are still dirty. The Bulawayo City Council is expected to collect all the garbage following the clean-up exercise. In an interview yesterday after a preparatory meeting ahead of today's national clean-up campaign, EMA provincial manager for Bulawayo Metropolitan province, Mr Decent Ndlovu, urged members of the public to participate in the exercise. 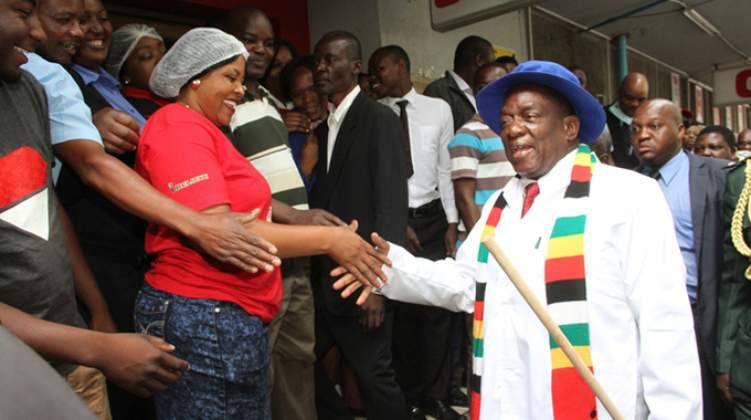 "We look forward to every individual to actually step up and say between 8AM and 10AM we are cleaning our Zimbabwe. We are going to maintain the same areas, our Makokoba is still dirty. We are going to focus on Makokoba and send more teams there, 6th Avenue and our Market place are still dirty," said Mr Ndlovu. He said a number of corporates and institutions would clean up the Central Business District. "So we are going to have a hive of activities taking place. We are inviting everyone to be part of this. This particular event is going to be a success and it will continue to have more impact in the future," Mr Ndlovu said. He hailed companies that have joined the initiative and adopted areas to clean up. "We have quite a number of companies. ZPC (Zimbabwe Power Company) has come up and adopted a place, Delta, Simbisa Brands, PSMAS (Premier Services Medical Aid Society) and the residents associations are also taking up areas to clean. We also have the Zimbabwe Council of Churches who form the bulk of stakeholders. They have also come up to embrace this clean-up process where they will mobilise their church members to converge at various venues to clean up," said Mr Ndlovu. He said others that had joined are Ocean Bird Foundation, Empower Bank, Rainbow Hotel, Pick n Pay and Transport Associations among others. Mr Ndlovu said among areas to be cleaned up are schools and institutions of higher learning, Emthunzini Children's home, Thorngrove – Home Of Peace, residential areas, commuter omnibus ranks and Makokoba Mkambo area and others within communities. Meanwhile, Environment, Tourism and Hospitality Minister Prisca Mupfumira yesterday confirmed that President Mnangagwa would lead the clean-up campaign at Parirenyatwa. First Lady Auxillia Mnangagwa will lead proceedings in Mutare. "The President will be involved in the monthly exercise and will be at Parirenyatwa Hospital," she said. "People are conscious of what is happening and they are enjoying it. Yes, the campaign is Government-led but many people have joined in and these include the private sector, non-governmental organisations and churches. This time our own departments in Government will also be taking part." This month's national clean-up launch will be running under the theme "My Environment My Pride." "We are saying let us begin by cleaning wherever we are as they say charity begins at home. All the provinces have mastered the concept and every province has a main centre. Let us work together to make Zimbabwe clean," said Minister Mupfumira. The clean-up exercises takes place between 8 and 10 AM. The Environment Management Agency (EMA) and Harare City council yesterday carried out door to door awareness campaigns ahead of today's event. Addressing journalists yesterday, Primary and Secondary Education Minister Professor Paul Mavima said school children will take part in the national clean-up exercise. "As the Ministry of Primary and Secondary Education, with an enrolment of 4.5 million learners, a workforce of 130 000 and 8 500 schools strategically located in our communities country wide, we seek to make our contribution to the national cleanliness effort," he said. "Schools will ensure that cleaning will take place between 6:45 am and 8 am and school heads have been instructed to ensure protective gear is provided in order to avoid contact with harmful bacteria. Health and hygiene are key pillars in creating a conducive teaching and learning environment. We see the campaign as a fundamental proactive programmer aimed at keeping our persons and our environments clean." He said departments under his Ministry will participate in the exercise. "For sustainability, a committee has been set up at each level to focus on the cleanliness of their environment and maintain a high level of hygiene in all our institutions," said Prof Mavima. On Tuesday, Environment, Tourism and Hospitality Industry secretary Mr Munesuishe Munodawafa commended corporates for being involved in the cleaning initiative. He said in Harare major hotspots had been targeted for cleaning today. These include VID Eastlea, Mbare Flats and bus termini, Waterfalls Park Street, Zindoga business centre and the Harare Central Business District. City of Harare Environment and Amenities Manager Mr Lisben Chipfunde said council has availed enough waste disposal trucks for refuse collection. "As the Harare City Council we have hired enough trucks to help in refuse collection, more of the hired trucks will service Mbare suburb where most of illegal structures were demolished recently," he said.